Daniels cut a promo before the match, claiming that he and Kazarian are responsible for ROH's success. He said Motor City Machine Guns are dodging them -- so they'll beat up the other half of Search and Destroy as punishment. The Addiction ended up winning with Celebrity Rehab, though the match was a good showcase for Gresham as he shined here. - Kenny King came out to say that his tag team partner Mark Briscoe is injured with a dislocated elbow. King put over Ohio State since they were in Columbus, then called Marty Scurll and Hangman Page the Bullet Club "B Club." King challenged both since he didn't have a partner. Scurll fired back by saying King couldn't get a date on a TV reality show (King was on The Bachelorette) and couldn't get a partner because no one likes him. Scurll said King could even choose a fan, referee, or commentator as his partner, which led to Colt Cabana being brought out as King's partner. Everyone involved in this match was really over, including Daryl.They ended up having the best match on the show, which ended when Lethal hit the Lethal Injection. These two had great chemistry. Will Ferrara and Rhett Titus joined Ian Riccaboni on commentary for this. Alex Shelley and Chris Sabin were posing on the turnbuckles before the match, then they were jumped by Young and Bruiser. These teams worked well together and had a great match, with Motor City Machine Guns retaining after a combo top rope crossbody/neckbreaker on Bruiser. BJ Whitmer came out to do color commentary for the rest of the show in place of Cabana. Suzuki-gun offered the Code of Honor to start, but that didn't end well for Chaos. 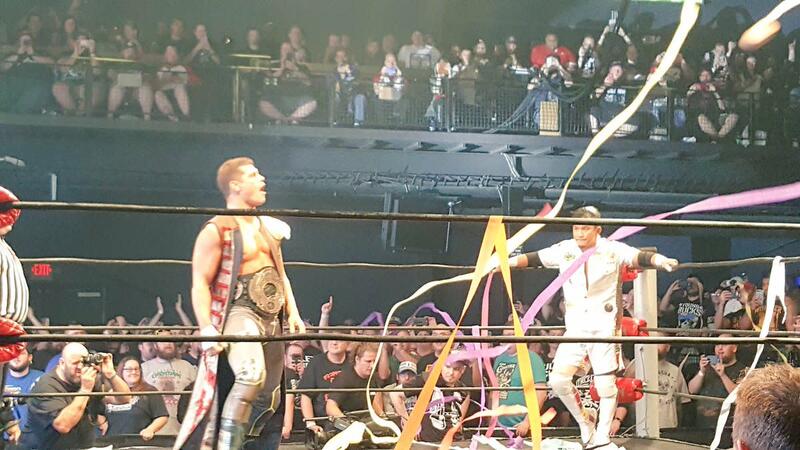 The story of the match was that Suzuki-gun had Chaos completely outmatched except for Ospreay's high-risk moves, YOSHI-HASHI refusing to quit, and Yano's self-survival skills. Archer and Smith were setting up for the win, but Ospreay hit Archer with a springboard forearm into a roll-up by YOSHI-HASHI for the pin. Chaos then got the heck out of there while Suzuki-gun tried to figure out what happened. Holidead was making her Women of Honor debut here. She dominated with power moves and hit a Samoan drop that looked to finish it, but Sakai caught her with a small package for the pin. This had plenty of power and strikes. Woods gave his much larger opponent a German suplex but got caught trying a running forearm. Taylor made him pay by hitting a sit-out tombstone for the win. The story of the match early was that Scurll and Page weren't expecting Cabana, who got in their heads. Scurll and Page played to the crowd a lot. At one point, Scurll went for the finger-break spot, but Cabana had an oven mitt stashed in his tights to keep Scurll from snapping his fingers. Cabana then slapped Page around and out of the ring with the mitt. King got the pin on Page with the Royal Flush. He celebrated after by holding up the TV title with the oven mitt. There was an interesting dynamic where King played it mostly straight in the match while the others did comedy. Cody did a lot of stalling early, using the kiss-the-ring gimmick and arguing with fans. He appeared to be walking out of the match at one point. KUSHIDA had the advantage early and kept wanting Cody to engage, but Cody would bail out of the ring whenever he was in trouble. KUSHIDA had Cody set up for the small package driver, but Cody reversed it into the Cross Rhodes to retain. The match was getting hot towards the end. The Bullet Club again said they were using "Bullet Club rules," meaning any members of the stable can defend The Young Bucks & Hangman Page's six-man tag titles. This match could have been its own episode of "Being the Elite" as Barreta and Taylor kept having to keep Gordon from getting suckered into a handshake rib, which is a storyline on the YouTube show. They kept the gag going as one of the Bucks would pretend to be his partner in the corner and grab his hand. The match was a great showcase for Gordon, who was impressive the entire time. There was a lot of comedy and a lot of playing to the crowd, but it picked up towards the end. Cody, Scurll, and Page all came out at one point to interfere, but they were kicked out of the ringside area. Barreta and Taylor set up a table to double chokeslam one of the Bucks off the stage, but the rest of The Elite came in for the save -- with triple superkicks putting Barreta and Taylor through the table. Gordon was left alone and took a Meltzer Driver on the floor as one of the Bucks jumped from the stage. They brought him into the ring for the One Winged Angel Meltzer Driver to get the pin. The rest of the Bullet Club came out to celebrate after. They cut a promo saying nothing will stop them from being more creative than the competition and they'll carry on as long as the fans are with them.